Home Costs > How Much Does it Cost to Remove a Load Bearing Wall? A load-bearing wall is a wall that rests upon the foundation, and these walls may also house electrical wires and plumbing pipes, being much different than an interior non-load bearing wall. While some walls are not necessary to uphold the structure of a house, a load bearing wall is, and in some circumstances, in order to open up a living or kitchen area, many homeowners may find that they will have to remove a wall. The outer walls of the house are also load bearing, and one of these walls may need to be removed or renovated if you want to put in something like a porch. While some walls can easily be removed without any obstacles, homeowners have to proceed with caution when removing a load bearing wall. If this wall is removed the wrong way, it can potentially cause damage to the home, allowing the outer wall to become unstable and even lead to it collapsing. The cost of removing a load-bearing wall will come down to the size of the wall, the contractor being used and the complexity of the job. Before you even consider removing a load bearing wall, you will first need to hire a structural engineer/architect to design the beam, analyze the situation, prepare drawings and secure any permits. For this consultation and design, plan on spending at least $300 to $600 before the job even begins. Now, if you were to use an engineer and planned on going through with removing the wall, then for a professional contractor, plan on spending anywhere from $2,500 to $14,000 for a wall that is about 10 to 15 feet wide. While this may sound like a higher price, you have to keep in mind that a lot of work has to go into tearing down a load-bearing wall such as reworking the plumbing, electric, ducts and if beams have to be reworked, factor in even more in terms of costs. Since there are so many unique situations and there’s really no average cost, it’s best to get a quote from a local contractor. For example, if you used HomeAdvisor.com, you could describe your scenario and local licensed contractors could contact you with free quotes. For instance, if you were to remove from the ceiling to the floor, then this could be the most expensive type option and could cost you anywhere from $2,000 to more than $5,000 as long as you can accept a one-foot deep beam across the top of the new opening. If supports have to be put beneath the floor below, you need new piers or the ceiling requires more joists to carry the new loads, then this is when your costs can easily reach $10,000. On a forum thread on GardenWeb.com, forum members claimed that they paid anywhere from $2,500 to as much as $10,000 or more to remove a load-bearing wall. The lower costs, however, were for walls that were not considered load-bearing. ReliableRemodeler.com claims that it is really hard to pinpoint an exact price point. He claims that you should budget anywhere from $3,000 to as much as $6,000 to have a basic load-bearing wall removed. On a DIYChatRoom.com forum thread, the original forum member posted a picture, asking what it would cost to get a wall removed, and according to contractors who responded, the costs should be in the $1,000 to $2,500+ range. With a load-bearing wall, the contractor will want to size up the situation and determine what needs to be supported. Once the situation is figured out, the drywall will be stripped and a temporary support wall will be put in place. You will be able to have a decision regarding this support beam, such as the style and material, but the placement of the beam may not be negotiable. In some cases, posts may be required as well. 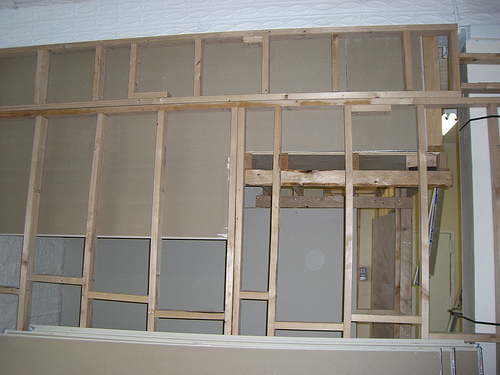 After the support wall has been installed, the main bearing wall will be torn down completely. If any wiring, plumbing or ductwork is within the wall, this will have to be routed to another wall nearby. When the wall has been completely removed, a new permanent beam may be set to replace the old beam. To see how the entire process works, visit this Family Handyman resource. Depending on the city and state, some may require a permit when tearing down a load-bearing wall. If this is the case, permit fees may be required. Check with your local ordinance. If electric wires, plumbing or ducts have to be moved around, the costs can go up due to the complexity of the job. Those who remove a loading bearing wall will often have to outsource the plumbing and electrical work to a licensed contractor. Adding a door frame or a new door can add to the costs. Once the company has removed the wall for you, you need to consider other projects such as repairing the drywall, painting and/or decorating. Depending on the look of your home, you may want to get a more decorative beam or cover the existing one with something more pleasing to the eye. Because of the complexity of this job and the fact that it can cause damage to the house if it’s done incorrectly, it is one that is best left to the professionals. You would not want to harm the house in any way. In some cities, even if you wanted to remove a load bearing wall, you may not be able to due to local restrictions and code. Talk with your local permitting agency for guidance. It is hard to give an exact quote or even an estimate over the internet. With that being said, it is best to get at least three quotes in your area. If you do not know how to receive quotes, consider getting multiple quotes from reputable and licensed contractors at HomeAdvisor.com.